Guide to Understanding Pet Health Insurance book by Dr. Doug Kenney DVM helps pet owners save on medical care for their dogs, cats and other animals. A Three Legged Dog Called Present is a teen level reading children’s book to teach kids to appreciate and care for dogs and to prevent abuse and mistreatment. Champ’s Story: Dogs Get Cancer Too! 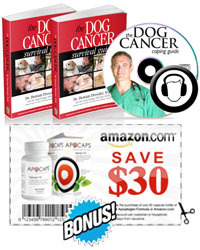 is a good book to teach kids about pets and dogs with cancer. Learn how to explain tripod dogs too with Tripawds book recommendations.